Woodrow Wilson was the 28th President of the United States, serving two terms of office: 1913-1917 and 1917-1921. 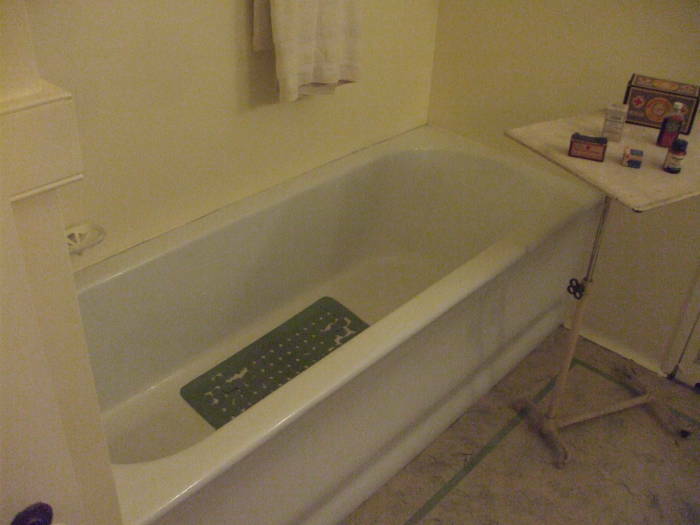 Click here if you are anxious to get to the plumbing details. Otherwise, you might be interested in the man and his role in history. He is the only U.S. President to have earned a Ph.D. It was from Johns Hopkins University, in Political Science. He taught at Princeton University and served as its president from 1902 to 1910. He was elected Governor of New Jersey in 1910, and won the American Presidential election in 1912. He maintained a policy of strict neutrality as Europe built up to the Great War, later to be known as World War I.
Wilson's re-election campaign in 1916 was based on his having kept the country out of the war in Europe. But then Germany's increasing belligerence forced the U.S. into the war. 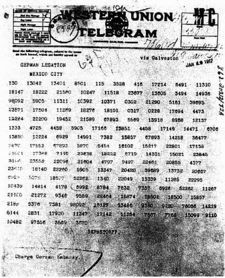 The Zimmermann Telegram was a coded message from the government of Germany to its legation in Mexico City. The telegram instructed the German diplomat to approach the Mexican government with a proposal for a military alliance. The proposed deal was as follows: Germany was about to begin, with no warning, sinking every American merchant ship its submarines could find. If the submarine warfare brought the U.S. into the war on the side of the Allies, Mexico would then enter the war on the opposing side of the Central Powers. Germany would see that Mexico regained the territory it had lost in the Mexican-American War of 1848: the U.S. states of Texas, Arizona, and New Mexico. The telegram was transmitted by radio and across two telegraph routes. Germany was forced to use telegraph routes that touched Britain, and the messages were intercepted by British intelligence. British cryptographers in the Admiralty's Room 40 decoded the message. The British wanted to use the telegram to draw the U.S. into the war on the Allied side. However, sharing the contents would cause two security problems. First, revealing to the Americans that British intelligence monitored and intercepted neutral diplomatic traffic. Second, revealing to the Germans that the British had broken the German code. The British solved the first problem by bribing an employee of the commercial telegraph company in Mexico for a copy of the encoded telegram and then saying that it was their source of the ciphertext. They then solved the second problem by announcing that a cleartext version had been stolen in Mexico. Wilson delivered his War Message address to the U.S. Congress on April 2nd, 1917. He said that his position of "armed neutrality" was no longer tenable, as the Imperial German Government had announced that its submarines would sink any vessel approaching the ports of Great Britain, Ireland or the western coast of Europe. He asked Congress to declare that the recent actions of the German government were an act of war, and proposed that the United States enter the war to "vindicate principles of peace and justice in the life of the world as against selfish and autocratic power". He said that the Zimmermann Telegram showed that the German government "means to stir up enemies against us at our very doors", and further charged Germany with having "filled our unsuspecting communities and even our offices of government with spies and set criminal intrigues everywhere afoot against our national unity of counsel, our peace within and without our industries and our commerce". Wilson closed with his famous statement that the world must be made safe again for democracy. Congress passed a declaration of war two days later, and Wilson approved it two days after that. Wilson pushed the Espionage Act of 1917 and the Sedition Act of 1918 through Congress, in order to suppress the expression of anti-war opinions. The Sedition Act of 1918 was repealed in 1920, but the Espionage Act of 1917 may be used in an attempt to prosecute Wikileaks founder Julian Assange. Wilson's Attorney General, with the help of his assistant, J. Edgar Hoover, deported about 16,000 foreign-born people. Sixty newspapers lost their right to ship papers by second-class mail after publishing material questioning the war or the President. 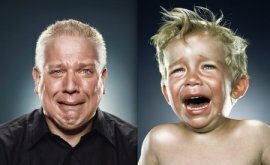 Which one is Glenn Beck? Click and win! Wilson negotiated for the armistice ending World War I, aiming for an equitable peace and statehood for formerly oppressed nations. His famous Fourteen Points address introduced the idea of a League of Nations to preserve territorial integrity and political independence. He spent six months at the Peace Conference in Paris, the first American President to travel to Europe while in office. The Treaty of Versailles included a charter of the proposed League of Nations. Wilson was given the 1919 Nobel Peace Prize for his peace-making efforts. Through late summer and early autumn of 1919, Wilson traveled the U.S. trying to raise political support for the Versailles Treaty. The strain seems to have led to a collapse in September of 1919 and a debilitating stroke the next month. He was paralyzed on his left side, blind in his left eye, confined to bed for weeks, in a wheelchair for months, and ultimately left unable to walk without a cane. The country functioned almost without a President for the last 17 months of his term. The full extent of his disability was kept secret until his death in 1924. Just before the end of his term in office, the Wilsons purchased a home in the Kalorama district of Washington, then on the edge of the city but now the heart of Embassy Row. The house had been built in 1915 by a wealthy businessman. 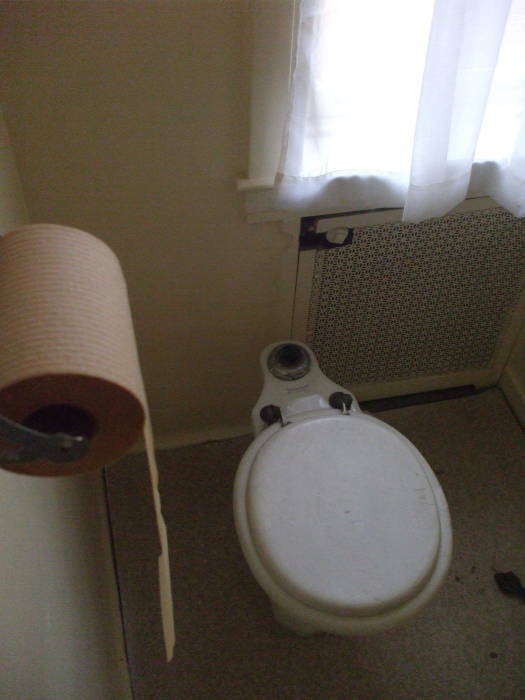 The house was of an advanced design for its time. All walls, including interior ones, are steel-reinforced concrete. There are plentiful electrical outlets throughout the house, and most rooms have call buttons that ring bells and light corresponding lights on indicator panels in the staff areas. 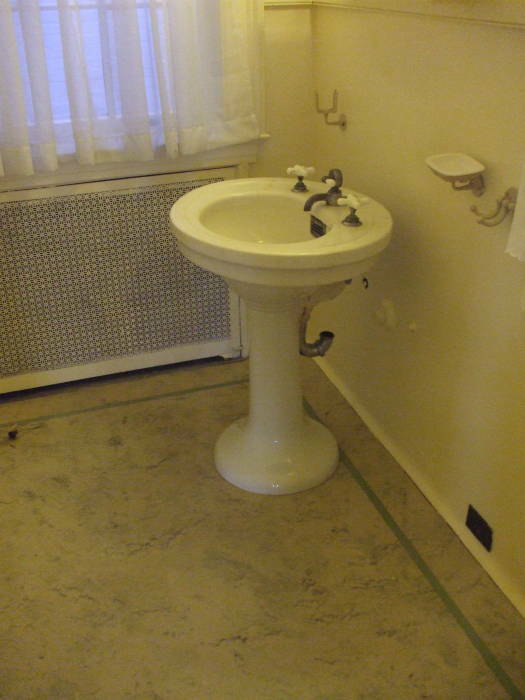 And, of course, there was modern plumbing. 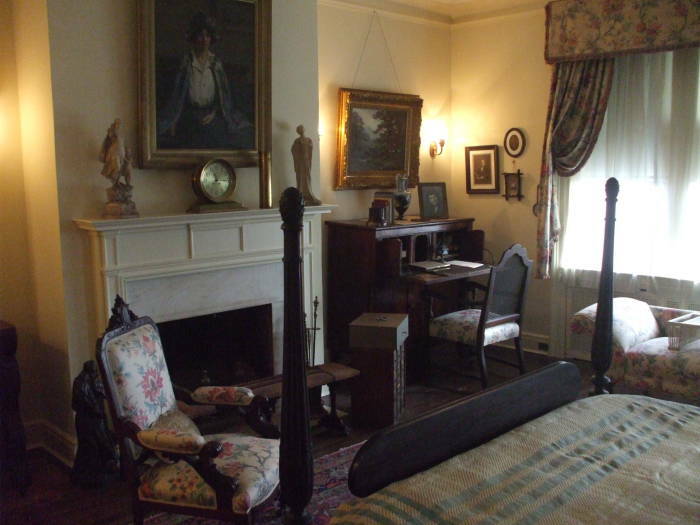 You can visit the Woodrow Wilson home today. It's a short walk from the Dupont Circle Metro station. Walk north along Connecticut Avenue to where it starts up a small hill, then turn west (to your left) on S street. The Woodrow Wilson House is about three blocks ahead on your left, before you go down the slope to Massachusetts Avenue. 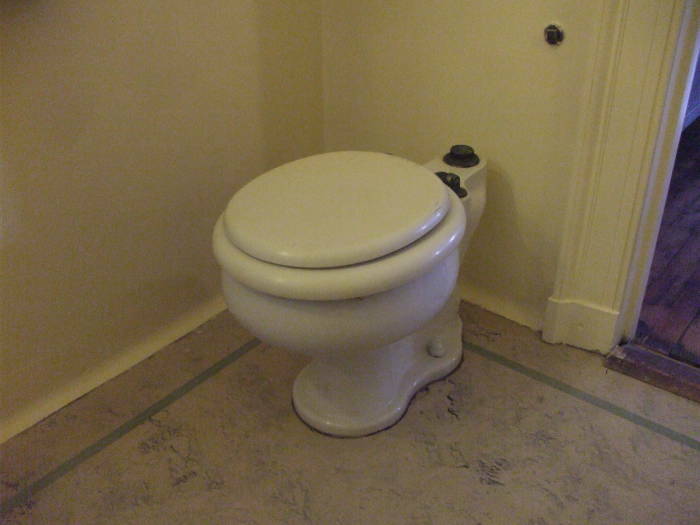 The toilets in both of the Wilson's bathrooms as well as his sink have been disconnected from the water supply and waste lines. 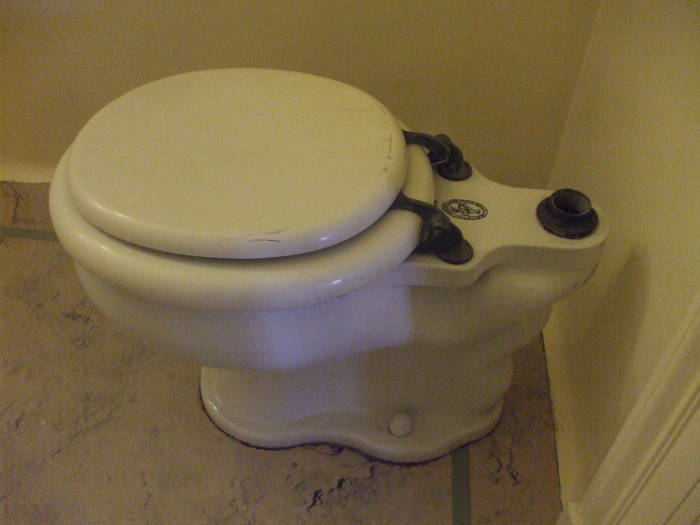 The toilets are missing their flush tanks, leaving it uncertain if each was mounted directly on the backs of the toilet or mounted high on the wall. 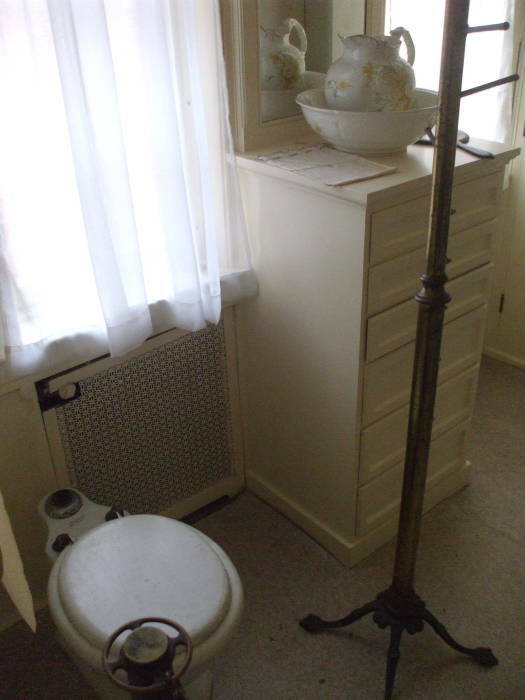 Edith Wilson's toilet and washstand. 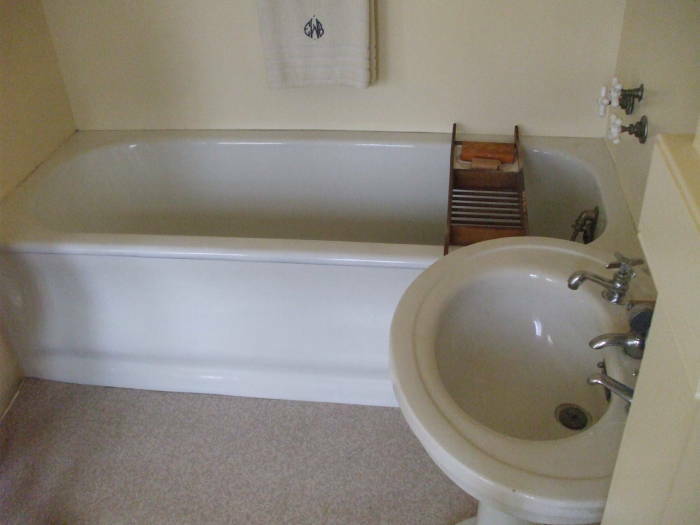 Edith Wilson's tub and sink. Presidents of the time received no pension when they left office, but they were allowed to keep the gifts they received from other nations. Edith Wilson lived in the house until her death in 1961, at which point the house was turned over to the National Trust. It's as if they just stepped out, with their clothes still hanging in the closets. 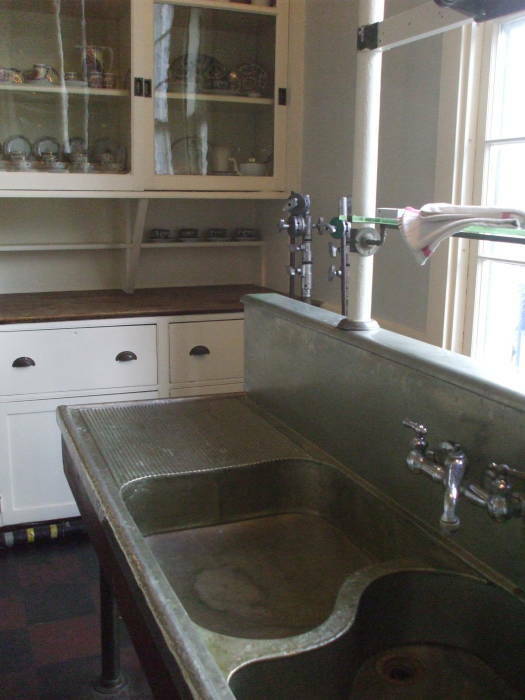 Sink in the staff area of Woodrow Wilson's home. 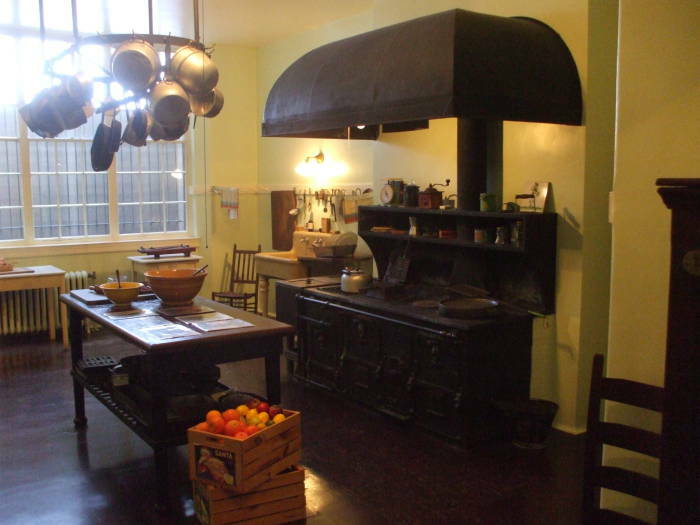 Large dual-fuel stove in Woodrow Wilson's home. 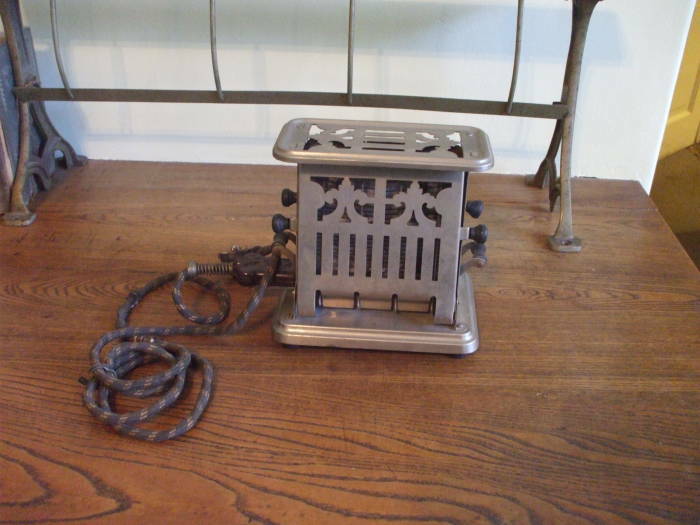 Electrical toaster in Woodrow Wilson's home. For more on Woodrow Wilson, visit the Woodrow Wilson Center in the Ronald Reagan Building in the Federal Triangle area along Pennsylvania Avenue between the White House and the Capitol. 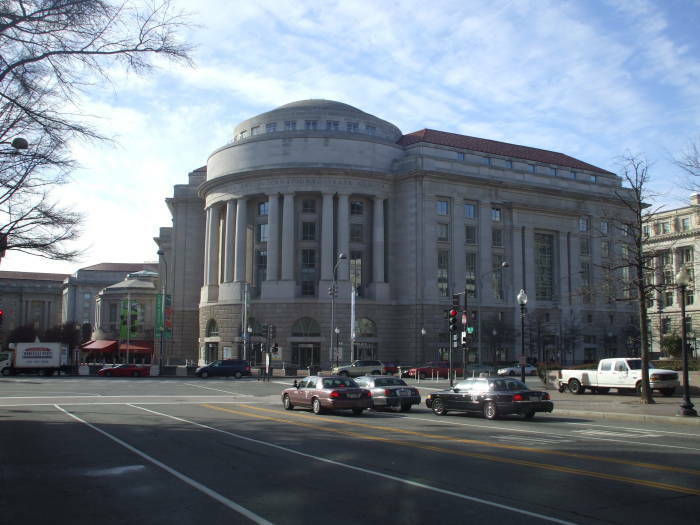 Ronald Reagan Building and International Trade Center. 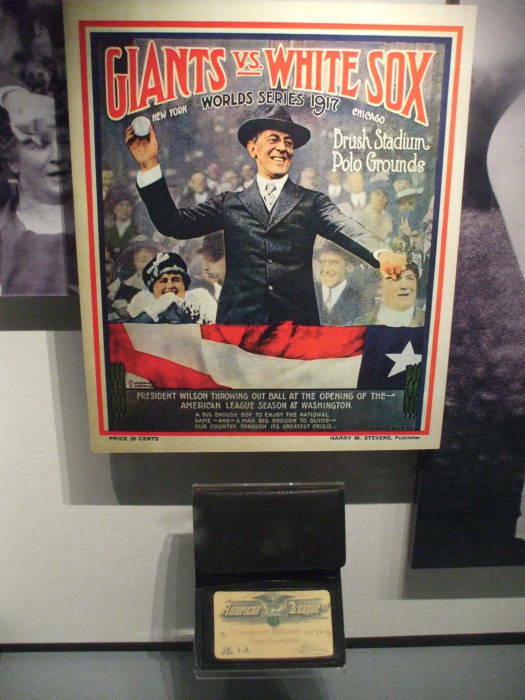 It includes a poster showing Wilson throwing out the first ball of the World Series, and the pass the American League gave to him. Wilson was a fanatical baseball fan, and attended games in Washington as often as possible. After his retirement he would be taken for a drive most every afternoon. If the Washington Senators were playing at home, he would go to the game. He couldn't negotiate the stairs of the stadium, so they would simply drive his car into the bullpen area. The back-up pitchers would just work around him. Poster of Wilson throwing out the first ball in the World Series and his American League pass. 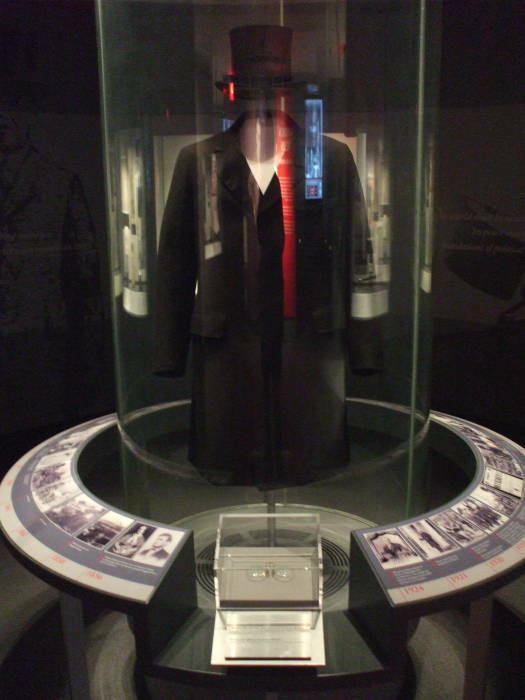 Woodrow Wilson's top hat, overcoat, and pince-nez glasses.